Every so often I read in newspapers that horses can sense what we feel, recognise, remember and thus think. Such a report follows weeks of up to the minute, specially designed tests which Maggie (who looks after our horses) and I read with amazement as we sit down over a cup of coffee. My husband, Geordie, would say we have too many dogs and too many horses. Like people and friends they come in all shapes and sizes. 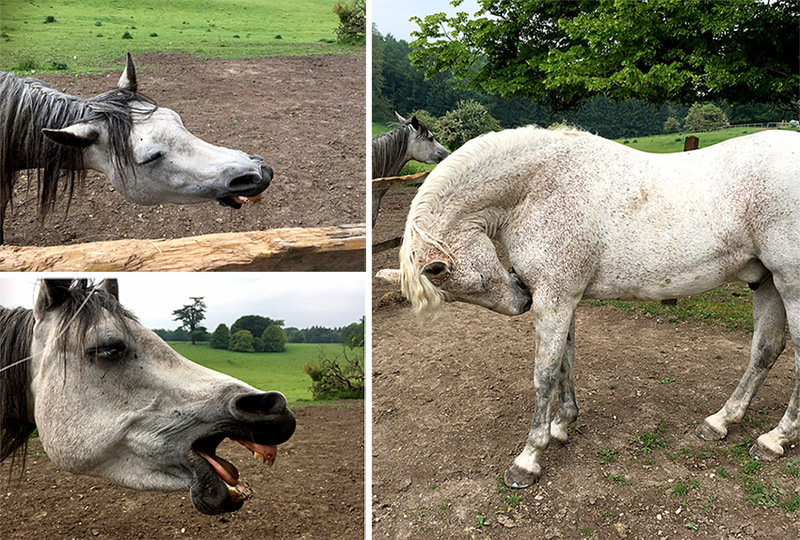 Phoebe, my Arab filly, is perhaps the most intelligent, not merely knowing her name but is so empathetic you can almost just look at her to ask her kindly to stand up rather than lie down. Speaking to her works as well, however. Frankie, a bay gelding I bred, is never convinced he needs to be groomed but loves going out to work. Lara is a real lady, delicately shaped feet, glossy bay coat with a golden sheen and obviously the boss. Mellow, the chestnut thoroughbred, never fails to have an accident but then rushes up for a cuddle, hoping to come in to a stable. If she were a human she would live in a beautiful pale, light filled apartment and be waited on hand and foot. A favourite of everyone’s is Muffet the Shetland pony who, despite being the smallest, will try to boss Ollie the Connemara around. I bought Ollie as a 14.2 hand pony, who would be a safe ride for my friends. He arrived here rather shut down, tense and muddled. He was so safe he threw Maggie on the very first ride. A year later, he is now rather wonderful, calm, walks with a swing through anything – scrub, wood branches, impervious to any obstacle and is 16.1 hands high. My old Arab mare Azzie remains the same, four feet rarely on the ground when I ride her, convinced that a lion might be in a tree, or the bough on the ground is a snake despite the fact she has only ever lived in the UK. Earl, the Welsh mountain pony, is sadly getting older and I have been observing him as his back dips and his legs stiffen. As a result, we have now acquired Skye, a little grey pony for my nieces to learn to talk to and ride. She is meeting her new “horse” friends, talking a lot, and not quite sure where she stands in the pecking order in the field. She is being left to relax and eat grass, with a little bit of lunging to help with balance and manners. Two foals are also sprawled out in another field, either snoozing or extending their ridiculously long legs to stand up and look for their milk bars (mothers). They seem to be rather relaxed and usually want their quarters scratched. Most people who own horses know that they are incredibly sensitive at reading our faces and body language. They need such empathy because, when they used to live in the wild, accurate apprehension meant they could evade trouble.They undoubtedly remember and interpret. 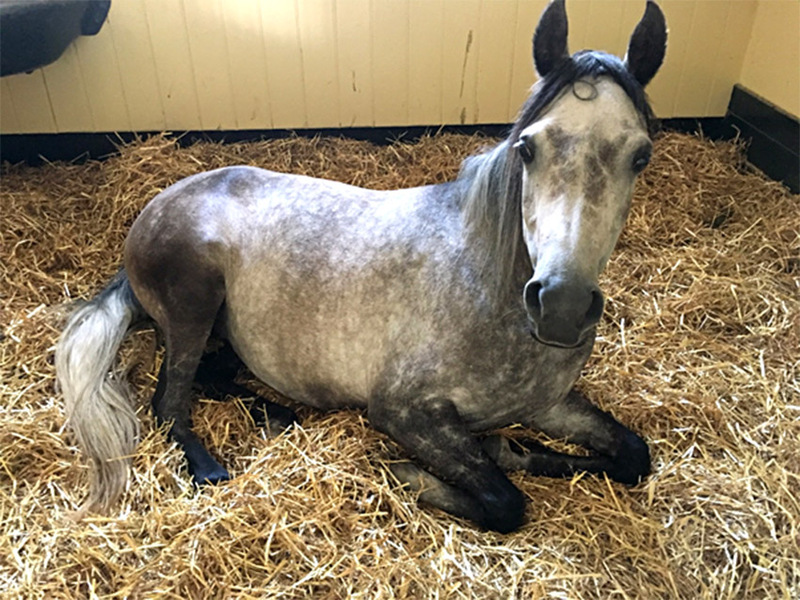 Frankie, now 9 years old, was fostered by Hottie, a truly beautiful grey mare who was owned by Gary Witheford, a “Horse Whisperer” – a horse trainer really. Years ago, one of my sisters had split up with a boyfriend and, utterly miserable, was staying with me. I thought a ride would be good so I saddled Hottie for her and Azzie for me and off we set. Hottie was so concerned with how my sister was feeling that she stopped every few steps to look round and check. My sister was full of woe and Hottie was tuned in. 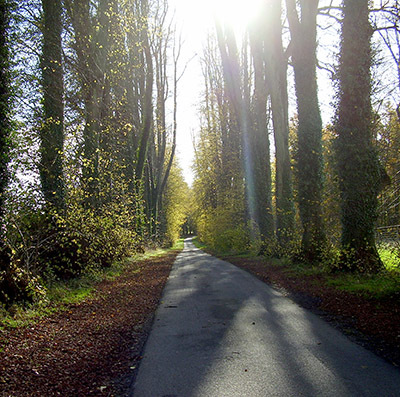 I encouraged them both but by the end of Lime Avenue I was exhausted. We had been walking and stopping for 45 minutes and gone about 500 yards. A drunken snail would have sped past us. Hottie spent the last years of her life here before I rang Gary to say that she was leaving us. I felt lucky to have known her. Horses do recognise us, they know our state of mind and riding them you can sense their mood too. They carry less “baggage” than us. Each day is a new day and one to be lived well. Perhaps they could teach us to re-consider how much of our baggage is really necessary. What a treat to see these beautiful animals. Love the fist picture. I want to print it out so I can keep looking at it. Well, actually I love them all. I have a horse farm in back of my house but right now the trees are too full for me to see them. But I can hear them and that’s a nice addition to the day. Wonderful and well said. I also have horses, and yes, they are amazing at recognizing friends either two legged or four. Our mares also live with a deer and I so enjoy watching them commune with each other despite the inter-species gap! I once sold a Walking Horse filly to a woman in Tennessee (my place is in Kentucky). After a career of showing there, she was moved to California & retired to trail riding/family pet. Unfortunately, it was a military family & when the owner was transferred overseas, the mare was well into her teen years, they felt such an old horse may not make the trip well. Looking at her papers, they found my name & got in-touch to see if I would be interested in taking her back. They flew her across the continent to Lexington where she was met with a horse trailor for the last 3hr. leg of her journey. As they pulled in to our driveway I heard her excited whinny–I was worried that she might be frightened–but no, her sire(whom we’d gelded a few year past so he could live out his years with his family) & dam were lined-up at the fence to greet her. Welcome her home? It certainly looked that way! It still makes me smile! I hope you will come over at some point! This was so lovely to read. You obviously love your horses and understand them so well. Thank you for sharing. What personality each of them have! Too sweet. Thank you for sharing. I wish to be there and help you with the horses! I love horses, in fact, I love all animals. Thank you for sharing. Still feeling bereft after the death of a life-long friend. Would love the equivalent of a ride on Hottie. I cried. Enjoy your blogs. your blog is fantastic. I love the house and the area since I watched Downton Abbey. Last June we spent our Holidays in England – first a few days in London and after this we rent a car and made a tour to Brighton, Newquay, Oxford, etc. On the way we stopped at Highclere with the great hope to have the possibility to have a look at your great home. Unfortunately exact at this time there was a shot at Highclere and we couldn’t enter. We only saw the tower of the house. But it is still on my “wish-list”. Email us when you are next passing through – there is usually a tour each week..
What a beautiful post about the special connection between horses and humans. The photos are absolutely stunning! All of your horses are special, but Phoebe is extraordinary. Her empathy and intuition are truly remarkable. What a joy! Our special friends can teach us a lot about acceptance and true friendship. Genuine friends… I’d love to meet Phoebe and ride Frankie. Thank you for the stories of your horses. I have always loved them but from afar and your words fed my soul. I believe that ALL animals have a keen sense on everything. Like a child who is blind may have the keen sense of smell, or hearing. What ever you are short on in life you will be blessed in other good fortunes in life. Horses have a very keen sense of direction, like a dog, and always be able to find his master or his way home. Thank you for letting me express my thoughts and views on this very warm subject, that you have brought to your beautiful webpage today! I wonder if horses are like dogs whose nostrils are separately attached to the brain. Dogs smell in stereo in order to tell which direction the smell is coming from. The story of your horses is so interesting, they are beautiful creatures. I cannot think of anything more pleasurable than mounting one of those horses and setting off through the woods and trails of your magnificent estate. Dear Lady Carnarvon 🙂 Good Morning, Good Afternoon…(it’s a beautiful morning here in the desert of SoCal)…still cool out so windows open for some fresh morning air. Nice to wake up to your wonderful post and photos about your horses. This all hit home for me, as I grew up on a Ranch in Colorado with sixteen horses, including a Shetland Pony and also a Welsh pony. Of them all, I remember an Arabian, a Tennessee Walker and a Pinto…I dislike that complete memories of them all evade me, but I was on a ranch with every animal imaginable LOL…so a lot of responsibilities. I do remember that a couple I was particularly close with…I rode with no saddle or bridle. I was determined that I could connect with them via sound (voice and little noises)…and touches of the neck from side to side, a slight tug on the back main to stop, one knew some French that I learned in Quebec whilst riding in a carriage through traffic, Haha! At that time, I got to see how in tune all the animals were in different ways…some more than others…the horses always ran up to me and they and my bike were my means of transportation growing up :)My bike was not as in tune as the horses, as it threw me several times whilst flying down country roads, a little to zealously! I was especially close to one of the cows (who was pleasantly surprised that I didn’t saddle her up), and several of the goats that I used to take on walks. I trained the goats to bow at the people leaving church on Sundays, as I was a bad kid and played hookie, hanging out in the barnyard instead. I am only just learning about the sensitivity horses possess. As a child, I was thrown by one, so I have shied away from them up until a few years ago. I have a dear friend who owned a horse and she taught me about how loving and loyal horses are towards their owners. Your insights about these wonderful animals go right along with what she has told me. All I knew was the fear of being thrown. Now I appreciate them for the magnificent animals they are. The photographs you shared are wonderful. They captured the personalities they each posses. I really enjoyed this posting. THANK you. My number two sister, Sarah, is equally wary of horses but happy I love them! Dear Lady Carnarvon, so happy to read another enchanting story of your beautiful horses. I understand each horse and their personality. I can even smell their sweetness from here. How blessed these magnificent creatures are to be so loved and cherished by everyone at Highclere. Thank you so much for sharing that tender story. Beautiful horses. The photo of the one with the head bent down (Skye? )is classically Greek..I wonder if he knows how beautiful he is? If not, please tell him, from me ! I am off to France on Wednesday and will be seeing my friends horses…they come to my house, poke their heads in the door and wait for apples or carrots. Fortunately they can’t climb the steep stairs or I suspect they would come in and raid the refrigerator themselves. Tell your husband what I tell mine (to no avail) that one can never have too many animals, especially cats, dogs and horses. My vet feels the same way as he holidays in some exotic paradise on his fees! (just joking..he is THE finest vet I have ever known and cries with me when end times come). I also try to pass on the vets’ fees to my husband..
How intimate you make Highclere and ALL the lucky ones who live there !! 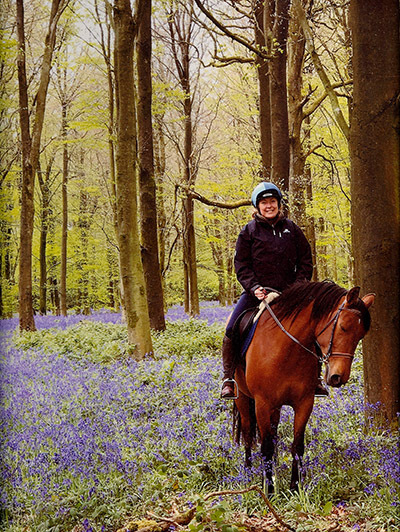 The love of your horses was a delight to read…..thank you !! Great read, wonderful black & white photo of you and your horse! It’s always such a pleasure to read your blogposts. This one was especially close to my heart. We had to put down one of our beloved horses only a month ago. I’m sure it will be painful for a while. I love how you have an assortment of breeds each with their owns quirks and personalities. Wonderful read!! I enjoyed reading this so much and perhaps you or Maggie could answer a question for me as I think it proves that horses certainly do have empathy and that they understand far more about us than we realize. My mother grew up on farms and was therefore very familiar with horses as they were literally the workhorses, she drove a pony and trap and could plough with a team of two heavy horses as well as any of the men, she was also called upon by her father to hold a horse if it required some treatment for an injury or illness which it might not like as they would do anything for her. After she married my father my mother no longer had horses but she often talked to me about them and later I discovered that horses will always come to me, from the far side of fields where they are grazing at times, and demand that I talk to them., This happened so frequently in the past, when we were walking in the countryside, that my husband remarked on it. He noticed it particularly when a lady on horseback approached us as we walked down a narrow lane, and despite constant urgings from her, her horse refused to pass us by until it had spoken to me, I suspect that the rider was not best pleased but there was nothing that I could do except to comply and make a fuss of it. How do they recognize me? If there is an answer I would dearly love to know what it is especially as it didn’t really start until after my mother died so it is a bit spooky although, of course, it is also very nice. Lovely blog, today. Your little grey reminded me so much of my “Dusty” who I received as a gift from my mother on my 12th birthday. She was a neat -footed little gal and only wanted to figure out what I wanted so she could do it. We lived on a ranch in California and had mostly registered quarter horses, but Dusty was a part Arab. She wasn’t too tall so I could leap on her bare back using a combination of grabbing the mane and swinging right leg up and over. She would patiently stand there while I was scrambling on. We had many other horses, but Dusty was always my favorite. Thank you for sharing yours with us. I love the smell of horses and I could almost smell them during this literary stroll. Thanks. Would that human beings could be so sensitive and accepting to one another. Thanks for your story! Oh yes! Brilliant idea! I wonder that I have never seen a mention of any cats roaming Highclere? Or curled up amongst the lovely things in the gift shop? Paul the chef has a cat! I can always ask Sally what she thinks about the gift shop – realistically it would set the alarms off. Blessings thank you for your beautiful post. What a delightfully-written piece! For decades we have owned horses, ponies, and now a little Sicilian donkey whose braying can be heard a half-mile away when he expresses an opinion! Equines are such expressive animals, and it certainly sounds like yours have a well-understood and well-cared-for life. I loved the beautiful photos as well. Thank you. The pony, Earl, has to pretend to be the donkey on Palm Sunday! One of my favorite stories! Thank You! Lady Carnavon, might I make a suggestion to combine your two loves, writing and animals and create a story about Highclere told by the animals of the estate. Here is a story called Ben and Me that was turned into a cartoon for kids to learn about Ben Franklin, but told by his mouse. It is a very cute story and worthy of watching. https://www.youtube.com/watch?v=c1X6l99y23Y Might be something worthy of your time and creative mind to consider. You could tell the story of Lord Carnavon and his discovery of king tut, or just about life at the castle through one of the countesses. Hope you take the suggestion, because I’d love to see it come to life. What a beautiful story! Your are as intuitive as your horses, knowing what they are thinking and feeling also. You can feel love between the lines of your journal. Beautifully written. Thank you! Though not an overtly religious man, my late father told me that horses were proof of God’s love for us and for the exact reasons you mentioned in your post. I admire you for this post. I take the long way home from work and pass by an Amish farm in Lancaster County, Pennsylvania. I look forward to Monday mornings when, after putting in the night shift, I stop along the edge of the road for five minutes to talk sweet to the roughest, toughest, hardest looking work horses that I have ever seen in my life. They stare at me as though they are intently listening. I’ve been doing it Monday mornings (the only morning of the week that they are out grazing) for two years now, and after about the first two months, they learned the sound of the LR4, and actually walk over to the fence as I’m coming down the road. They cause an involuntary smile on my face and are the sweetest animals… I just love them! Sometimes when I love on my Italian Mastif, I tell him that he doesn’t even know that there is such a thing as an unspoiled animal who feels no love. I fully appreciate when you share the joy of your animals. It’s a beautiful thing. Thank you! I am a recent follower of yours, and have enjoyed everything I’ve read, but this piece really touched my heart! Here in horse country(Kentucky)these animals are revered. Sadly, we had to give up ours after my husband broke his back and could no longer ride. We are grateful for his recovery, but do miss those peaceful rides along trails through the Bluegrass. Looking forward to our next trip to England and the chance to visit Highclere. I’ve been horse-crazy since I was born, and although it’s been ages since I last rode, I get the chance every once in a while to assist at a rescue barn (LEARN Horse Rescue in Hollywood, South Carolina) that cares for abused and neglected livestock, usually horses. Some of the cases they get are truly horrifying with the conditions the horses endured and the condition they are in when taken in, but LEARN is able to save the majority of them, and give kindness and comfort to those who only last a few days, weeks or months. It is a honor to be able to assist them with their work, as it can be heartrending for the people who run as well as volunteer at the rescue day to day. The laws in the States that punish animal abusers is typically very lax and it can be very frustrating to see how lightly some of the worst offenses are addressed. Sometimes the rescue gets cases over the years from the same person/family. I loved reading about your herd since I know they are all loved to bits, which shows in your pictures and words. 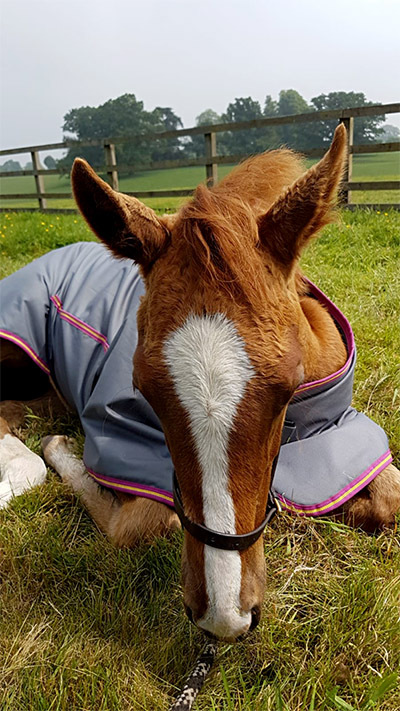 Thank you for sharing a view of your equine family… they are all lovely! I’d be happy to help Maggie with barn chores if I were there! 🙂 The smell of barn and horse is one of my very favorite in the world. I am at my happiest in my muck boots and barn coat hauling water and feed, blanketing/un-blanketing horses, or picking stalls/pastures on a brisk day. It sounds like you are doing a great job too! I loved this post! What fun and beautiful horses. I have been riding since I was 5 years old. My dad’s friend Col. White’s daughter, Dodie, taught me to ride English and western. She had ribbons, literally, floor to ceiling in her bedroom. All I had to do, I kid you not, was whisper “Let’s go!” to my horse Chance and he would break into a full run, racing and jumping over anything in our path even the smallest brook. He loved to jump. He once ran between two trees that were so close together that I had to raise my legs up to avoid being knocked off the saddle. LOL Great memories! I think I am reverting to childhood suddenly saying lets go to hear Maggie laughing behind me before she determinedly overtakes me. Thank you for sharing the joy of your horses at Highclere. The photos are wonderful and one can almost imagine being there along with you and Maggie. What wonderful grounds to ride through, with an animal that senses your feelings and can put you at ease in the world…just enchanting. Moments of ease to hold within when there are challenges. 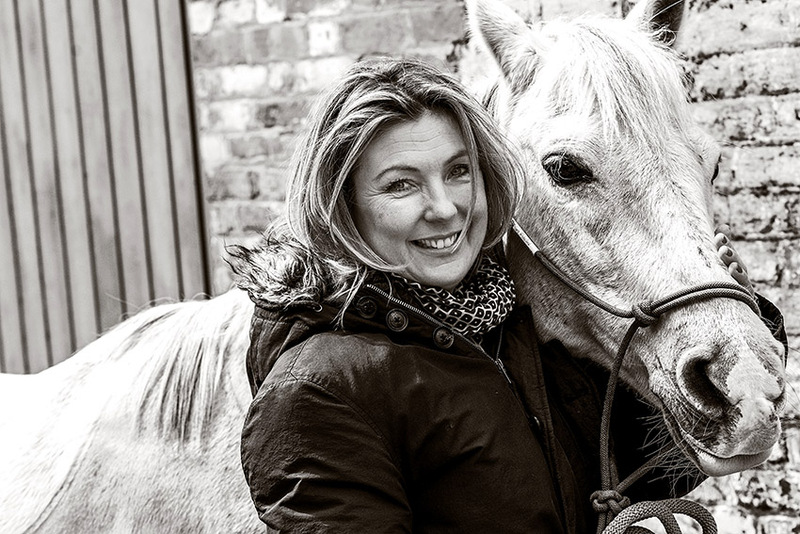 I love all animals, but one of my favorite encounters was with a big grey horse in England. Almost forty years ago, my former husband and I were on vacation and driving all around southern England. At one point we became a bit lost, so we pulled the car over to check a map. I got out of the car and walked up to a fence around a large field. I could see a few horses at the other end, and at that moment, the big grey turned around, looked at me and came trotting over. He leaned his head over the fence to greet me and receive lots of gentle rubs. It was so sweet, and I felt sad when we eventually had to be on our way. To this day I vividly remember that encounter. Thank you for introducing us to your diverse and wonderful herd! I can smell the hay and warm bodies from here. The photos are fantastic – I often wish there were a few more photos included in your wonderful posts. I especially delight in the one of lovely Phoebe – tucked under like a cat, ears pricked, and white eyelashes over those intelligent eyes! What an expression! My only regret during our tour of Highclere 2 years ago was that we did not get to see any of the stables. I would love to see any old carriages/carriage houses, etc.. from older times, as well. Fascinating! If I find people by them sometimes we pop in – it is a bit random! But when you come back, do let me know. I know with all the comments, you will probably not remember another reply when I mentioned the half Arbian mare that I show in non jumping hunt, based in Iowa in the US. Last year I decided I would like to show western again (it is truly about the bling) as I found what sounded like a perfect pure bred bay gelding for a reasonable price. They were about to send him down from Minnesota for a trial, when some medical issues came up and while those were being resovled the owner got a better offer and sold him to someone else. My trainer has been putting out “feelers”and, surpise, the other sale fell through and “Lenny” (barn name) or D’Vinci was again available and supposedly sound so we did bring him to the barn for a trial this month. He turned out to be the sweetest horse and I think we bonded in the short time he was there. He would come up and put his head on my shoulder and kind of gum it but not bite. Alas, in the presale vet check, it turned out his foot, hock and stifle issues had not been resolved, and although he could show again, it would take a lot of time and too much artificial help through injections, to make him show ready, which is something I did not want to do, as it is not fair to him and my husband already thinks I have one horse too many. I decided not to buy him for now as showing is my emphasis and I don’t have the luxury of taking on a project. I think Lenny actually knew. When I went to say goodby to him, before leaving on a second trip to England he came up, put his head on my shoulder, and promptly bit it. I think that was his way of telling me what he thought about my decision. I am writing this from Bristol with a large red bite mark on my shoulder. Sorry if this is long, but you are so right about horses knowing how you feel. I think we were both disappointed and I still have the feeling he will be in my life someday, but not right now. I do still have my mare. I visited Highclere last time I was here, and still hope to return some day. In the mean time, we did spend a lovely morning with the owners of Chavenage, with whom, I am guessing, you are probably acquainted. Thank you for your story – I do know the Lowsley Williams at Chavenage -they are brilliant! Your horses are beautiful.I think they are wonderful animals.There are horses all around our area here in Wexford.It’s great to watch them passing our house. We always talk to them and they do respond in their own way.Will you have tours around September 12th/13th.My sister-in-law is visiting us from Peru.She’s quite a fan of Downton.Happy times with your horses and your dogs. Well that post was wonderful. I felt happy, I felt sad, I laughed and, considering the only thing I know about horses is which end to feed them, I learnt a lot. Dear Lady Carnarvon, as usual a totally excellent blog. I like you, love horses, and try to ride as much as I can. They truly are wonderful and loving creatures. And do sense your feelings and moods. You are very lucky to be able to own such magnificent animals. We will be visiting Highclere on June 6th, to have luncheon with a PBS tour, I hope that I will be able to visit with the horses also. Desiree . A wonderful story as always! Animals are God’s gift to man. Thank you for sharing. A kiss on a warm, soft muzzle….nothing like it…. Your lovely Arab filly, Phoebe, seems to be blessed with the fabled “Coins of Allah”! The several individual bright white circles on her rump are considered to be very lucky, and makes the horse more desirable. I used to raise and train Arab horses here in Colorado on a ranch near Boulder, with a fabulous view of the Rocky Mountains. My favorite, named Shaka Zulu, had the coins too. I’d send you a couple of photos of some of them, if I could! I am very happy to hear she is lucky!!! How lovely to have such an eclectic crew of horses! I am down to only one….my quarter horse is now 31! Debating whether to get another as he is retired and living an easy life. At my age, 66, it is something to ponder! But perhaps it would keep me limber! I do not own horses, but I live in Louisville KY, USA, the home of the Kentucky Derby. So I have learned to love and appreciate horses! We are following the Kentucky Derby Winner “Justify” to see how he does in the Belmont Stakes in a few weeks! I really enjoyed reading this posts. I agree with the reader who suggested that a children’s book on horses would be great. I would take it a step further and say that a book about each of the horses named in this post would make a great series on horses for children. I just wanted to say thank you for sharing this beautiful writing! I worke with Horses and humans everyday and it’s so amazing to see what the horses are about! There hearts and true nature is so beautiful and full of kindness and love! There only desire is to be treated nicely/with respect and they will be your truest and best friend for life! Thank you so much for sharing your thoughts and I have to say your horses are truly blessed to have you as here owner! Thank you for this wonderful testimony about your love of horses. Love that I share because a few years ago I had a wonderful horse that understood better than anyone my moods and with whom I discussed every morning by bringing it to the field. He opened his mouth wide as if he were telling me the night he had just passed. That is a life and life. As always…Thank You for sharing! Hope to visit soon! Lovely photos! We had two Welsh Mountain ponies at our Texas ranch. I love Arabian horses too. Would have loved to have seen the stables and horses when I was at Highclere for your June Cakes and Concertos event. I did not realize you had a horse feed brand too! I am enjoying your blog very much, especially the Dogs and Horses entries, as both have been a major part of my entire life, as well. I raise horses myself here in Oklahoma, and love them all with each having a distinct personality. I have too many to name here but let me tell you of some: Beau and Siobhan are the only two left of the original herd who started the ranch with me years ago; Fancy, the gorgeous palomino show mare with the horrible registered name of Silicone and Peroxide; Harlan, the old bay roan lady who is as sweet as she is lovely; Emmy Lou, the flea bitten gray who was my rehab horse after surgery and now patiently teaches my grandson to ride; Sierra, the young mare from ‘back east’ who is so smart and funny; Major the red roan gelding I ‘snitched’ from my hubby because his jog is as smooth as silk, and last but most definitely not least, is Skip, the stallion of my dreams. He is huge, beautiful, and as gentle and kind to the mares and foals as he is to me. I tell folks if all stallions were like Skip, everyone would have one! I am so pleased to have discovered your site and thank you for sharing your days with us. I look forward to continuing reading and enjoying your entries. I love this blog about horses. They are very sensitive creatures. I have two horses right now .But horses have been a huge part of my life. My parents breed Quarter horses until I was 11 yrs in Arizona. I started exercising race horses at a farm in New jersey until I was 18 yrs old. I re-trained horses that we bought at the slaughter auctions. This is where I found “Fast Ted He is” my now 30 yr old xrace horse. “Teddy ” know when I have gone on vacation and left him. The moment he hears my voice he weenies to me. Which make me smile. Due to back issues (thanks to gymnastics) I own a gaited mare (Peruvian paso). My old man seems sad we are no longer riding together. But his gaits are to rough for my back. I wanted to say also I would love to ride the beautiful meadows you have. Thank you for the description of your horses. I have just found this site and I am very excited to look back at everything you have written and wait on pins and needles for the next weeks entry. I specifically wanted to comment on this blog because I have always loved horses. I ride dressage in Texas. Reading about the personalities of each of your horses gives not only a beautiful picture of them but also of the grounds and of your wit. One of the things that drew me to your overall blog was the witty comments you leave, they made me smile. As I’m sure I have rambled on enough, I’ll sat again thank you and have a great day.